With thanks to countless donors and over 2,000 breakfast attendees, the PICOR Charitable Foundation (“PCF”) awarded $50,000 in grants in November, representing 100% of the proceeds from the 22nd Annual Pancake Breakfast. The Tucson-based firm and its foundation remain humbled to continue making an impact on the region’s youth via this annual event and effort. 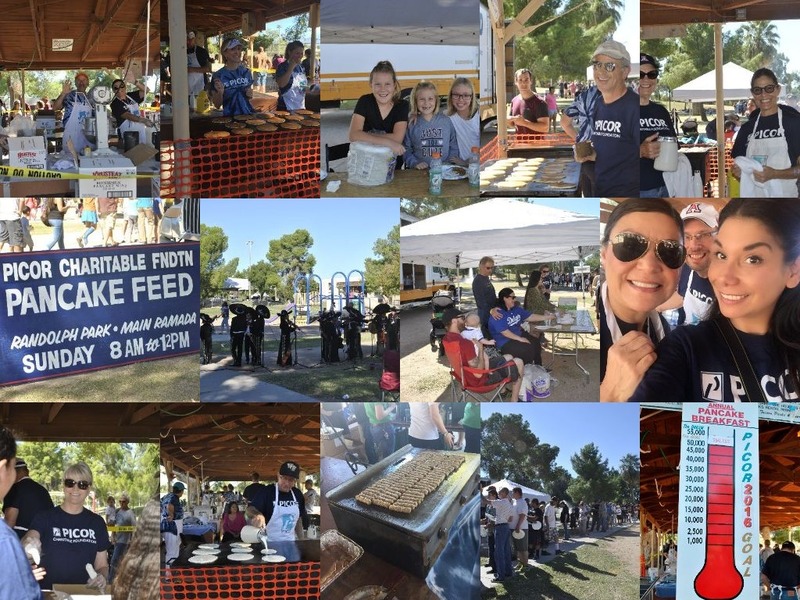 In the weeks leading up to the pancake feed, held October 9th in Tucson’s Reid Park, the volunteer grant committee received applications from 72 nonprofits serving Tucson’s youth in need, totaling over $164,000 in funding requests. In November, Foundation volunteers selected 40 youth-serving charities to receive the full $50,000, just in time for the holidays. In addition, two STEM-specific “Ken Nickel Memorial Grants” were matched by corporate dollars from Cushman & Wakefield | PICOR, in honor of a former Kiwanian and dedicated, founding PCF volunteer: San Miguel High School and the YMCA of Southern Arizona. The Foundation carries forward a 32-year tradition started by the former Palo Verde Kiwanis Club. Combined with PCF’s continuation of the event since 1994, cumulative giving to Tucson programs now exceeds $1,000,000. Cushman & Wakefield | PICOR’s 44 employees plan, staff, and raise funds for the Annual Pancake Feed each year. At the 2016 event, over 2,000 individuals were served pancakes, sausage, milk, hot chocolate and coffee, staffed by Cushman & Wakefield | PICOR and Starbucks Arizona’s energetic volunteers. Thanks to generous in-kind community partners and PICOR’s corporate underwriting of direct expenses, 100% of the funds raised are granted to youth-serving programs, and many attendees and applicant agencies are given complimentary breakfast tickets. To donate or apply for funds in our 2017 cycle, please visit www.picor.com/picor-charitable-foundation.